Wedding Rings for Big and Fat Fingers That Look Great! OK, some of you may not want to admit it, but the truth is that you have five “sausages” on each hand. Then again, there are others that are proud of the size of their hands. Still, when it comes to shopping for wedding rings for big fingers, your options are quite limited. The average jewelry store may sell wedding rings, but they do not carry inventory. Jewelry stores have samples in their cases which you can look at and try on, but they do not carry various sizes of each ring for you to try on and purchase on the spot. Chances are that they don’t even have samples large enough to fit your fingers. What they do is show you “styles” of rings, you choose a style, they measure your ring finger, and then they order your ring from one of their vendors. When the ring arrives (typically in 2-3 weeks), only then will you see what the ring really looks like in person on your finger. Here’s the problem with this…. First, you have no idea what your ring is really going to look like on your finger until the jewelry store actually receives the ring and you try it on. What happens if you don’t like how the ring looks on your finger and your wedding is only a few days away? Chances are that there just isn’t enough time to order a new ring. Second, what happens if the ring doesn’t fit properly? An interesting thing happens as rings get larger. If you try on a ring in a store on one of your smaller fingers, and it looks good and fits well, you will be surprised when you receive the larger sized ring for your ring finger because it will look and fit very differently. You simply won’t know how well a ring will fit until you actually have the correct size and try it on in person. WeddingRings.net stocks a number of wedding rings for big fingers. Any of the rings appearing on this page are in stock for immediately delivery up to size 16. We also stock two of our most popular rings in sizes up to 17. This first ring appeals primarily to women. 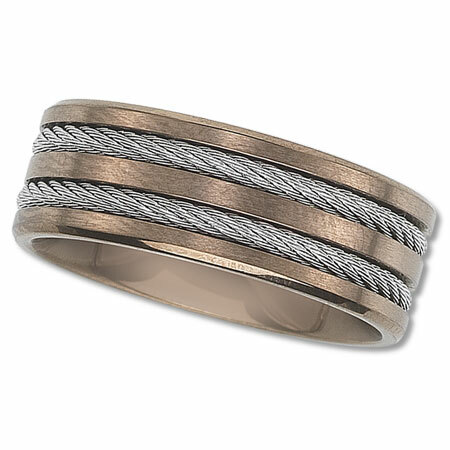 It is a rose colored titanium wedding band with a cable inlay. Because it is made of titanium, the ring feels light in weight but is very strong. The 8mm width coupled with the cable inlay makes a very bold statement. The second ring is a black titanium wedding band with cable inlay. As many guys are not accustomed to wearing rings, this ring is perfect for them because the light weight of titanium means you can wear the ring all day and not notice that you’re wearing a ring. 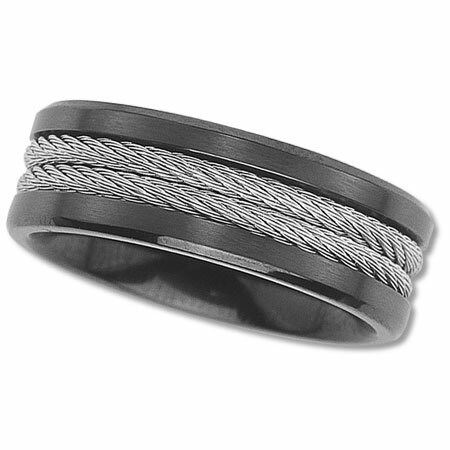 The black color coupled with the cable inlay makes this a very cool looking ring for guys. We have one piece of advice with regards to purchasing the correct ring size. We recommend purchasing 3 different sizes of the ring you are interested in. Purchase one size that you believe will fit you according to the size that your ring finger has been measured for. If you don’t know your size, please download this ring sizer and measure your own size. Then, when ordering your ring, order two additional rings. Order one size smaller and then one size larger than the ring size you have been measured for. After receiving the rings and trying them on, simply return the two rings that don’t fit and we will immediately refund your purchase. This method insures that you will purchase the best fitting ring. PreviousPrevious post:Wide Wedding Bands That Look Great and Are Reasonably Priced!NextNext post:You’re Crazy If You Buy a Wedding Ring Online!